The U.S. Department of Energy Solar Decathlon takes place every two years and challenges 20 collegiate teams from around the globe to design, build, and operate solar-powered houses that are cost-effective and energy-efficient. Anyone wanting to check out cutting edge home design and how to live 21st century style needs to check out what the student teams are up to. Two NYC teams are competing in this year's decathlon which takes place September 23rd to October 2nd on the National Mall in Washington, DC. This New Yorker is excited to have two local student teams going down to Washington D.C. to build their prototype homes on the National Mall; even if neither team takes first place in the competition, they will be winners for New York and show the rest of the world their innovative, smart dwellings and highlight NYC as the hot bed of green activity that it is has become. Students and faculty from the Bernard and Anne Spitzer School of Architecture and the Grove School of Engineering, of the City College of New York, comprise the culturally diverse and interdisciplinary called: Team New York. One NYC team participating is called Team NYC and is from the City College of New York. 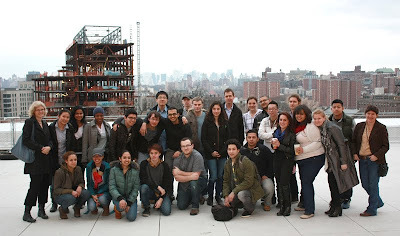 Team NYC at CCNY is interdisciplinary, comprised of creative minds from architecture, engineering, and the arts. The students, were engaged in all the project phases, from initial concept design to through to the fabrication of cabinetry. Their Solar Decathlon entry is called “The Solar Roofpod.” It is designed for the most underutilized real estate in the city: the flat rooftops of existing mid-rise (4 to 10-story) residential or commercial buildings. The Team NYC web site states: "These roofscapes offer tremendous potential as living space because of their direct access to solar energy, ventilating breezes, and nourishing rain. Team New York’s Solar Roofpod is designed to enable eco-conscious urban dwellers to live lightly, as stewards of a more resilient urban environment, cost-effectively producing solar power and heat, cultivating roof gardens, and retaining and recycling stormwater." The second NYC team participating in the upcoming Solar Decathlon is a team comprised of students from a consortium of New York institutions and was designed through a collaboration between Parsons, The New School for Design, The Milano School of International Affairs, Management and Urban Policy at The New School, and the Stevens Institute of Technology. The house by the consortium is called Empowerhouse, and will consume up to 90% less energy for heating and cooling than a typical home in Washington, D.C., with its use of passive house technologies. 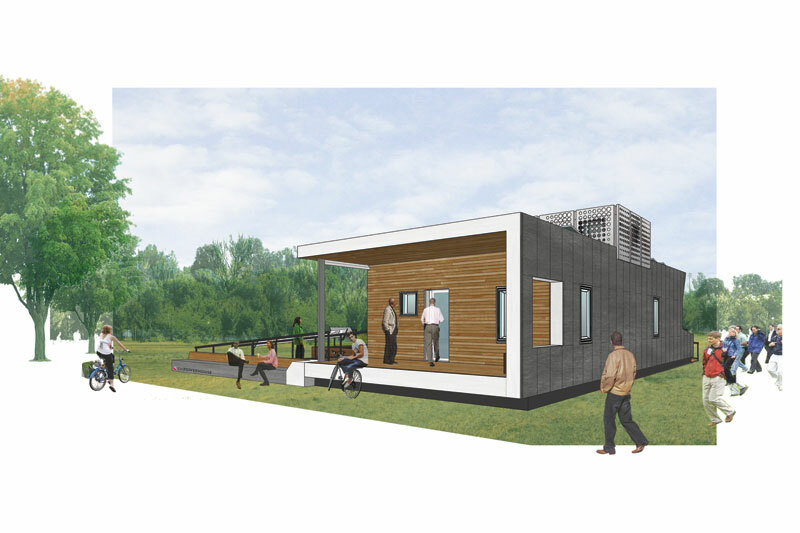 By working in collaboration with Habitat for Humanity, the team has arranged so Empowerhouse will eventually be moved and serve as a future residence for a family in the historic Deanwood community of Washington, D.C. The team web site explains: "Empowerhouse embodies Habitat for Humanity's vision that all people deserve safe, comfortable, affordable homes. The compact 1,000 sf one-bedroom structure showcases the whole-life approach while being sensitive to the existing urban fabric. The shape, building envelope, window placement, and shading were optimized through feedback from energy modeling. In addition, sustainable materials reduce maintenance costs and create a healthy environment." 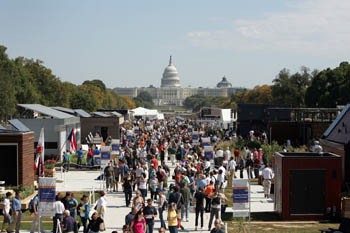 New Yorkers should consider heading down to D.C. to see all the homes that are part of the 2011 Solar Decathlon and support our teams from NYC. This writer is headed down to D.C. for a few days on the convenient, low cost bus that leaves from Chinatown in NYC and costs only $35 round trip. 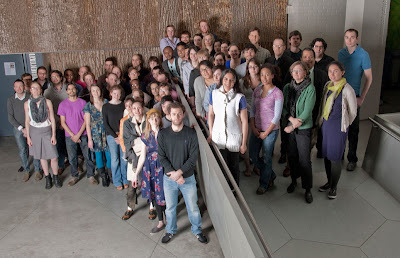 These clever, inspiring students are leading our city and country by building with their own hands, in a spirit of collaboration, homes that are designed to generate all their own energy, be affordable, practical and beautiful. They are showing us that clean energy for all is possible right now, and not at some far off place in a fossil free future. I for one am inspired to "hop on the bus" and head down to D.C., eager to learn from all their hard work.